← Lauren to be on TODAY! 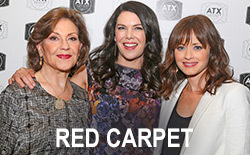 All About The Gilmore Girls Reunion! 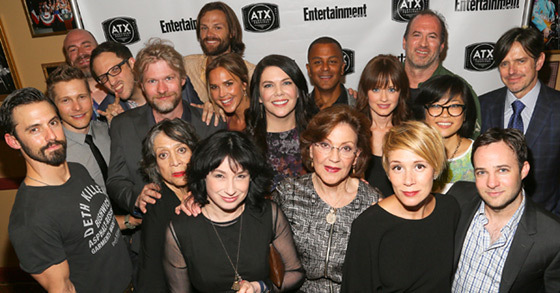 The Gilmore Girls cast reunited for the first time in 7 years last night in Austin. There were laughs and tears and all felt right in the world. While the event wasn’t streamed live (let’s hope we’ll get the video soon! ), it was largely documented on Twitter with live-tweets and pictures. In this post you’ll find a selection of recaps of the event, interviews and tons of pretty pictures. Note that this post will likely be updated throughout the day. Pictures posted by the cast or reporters have been added to our Gallery here. This entry was posted in article, ATX Festival, Gilmore Girls, pictures and tagged article, ATX Festival, Gilmore Girls, pictures. Bookmark the permalink. I definitely wanted to be an actor. I didn’t want to be on TV, I didn’t want to be famous, I didn’t want to be anyone in particular; I just wanted to do it. I see young people now who look at magazines, or American Idol and their goal is to have that lifestyle – to have good handbags, or go out with cute guys from shows, or whatever. But I definitely wanted to be an actor.